Avec cet hommage décalé aux films de défonce, Harmony Korine semble vouloir explorer le revers comique de l'univers de son précédent Spring Breakers. If you're expecting something linear or with a conventional plot, don't bother with THE BEACH BUM, you'll likely hate it. 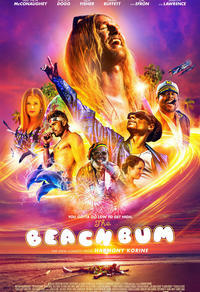 It's possible to appreciate The Beach Bum as a sustained and inventive piece of style-over-substance filmmaking (...). The 'Spring Breakers' director and a gloriously sleazy Matthew McCanaughey deliver a Trump-era ode to fear, loathing and the art of the perpetual happy hour. (...) The Beach Bum, he feigns harmoniousness, but the movie is full of dissonances, small and mighty. And yet there are points when "The Beach Bum" transcends that description. Pour les inconditionnels de Harmony Korine, parmi les rares cinéastes américains iconoclastes qui tournent comme bon leur semble. Le cinéma d'Harmony Korine n'a jamais fait l'unanimité et ce n'est pas avec The Beach Bum qu'il va commencer.